The port is right in the center of the city. Just a 5 minute walk. A new building is offering better services to cruise passengers and crew. The new terminal includes: shopping center, tourist information services. The shopping center Los Cantones, being very new, is primarily occupied with (fast food) restaurants and movie theaters at this moment. Free WiFi in the center. Taxis are available at 400 meters. It is a charming mixture of old town and new town also with a couple of beaches along the two-mile stretch of coastline it overlooks. The colonnaded Maria Pita Square is at the heart of the old town, with many shops, bars and restaurants all around. There are various fascinating museums including the interactive House of Mankind plus an aquarium and planetarium. Coruna is also the main Atlantic gateway to one of the most ruggedly scenic regions in Spain - Galicia. Among its attractions is one of the world's great pilgrimage destinations: Santiago de Compostela, with its Romanesque cathedral. La Coruna is however only good for a few hours of sightseeing. Tourist Information Point at Plaza de María Pita and at the Translatlantic Dock: open when a liner is in port. The once running and popular tourist tram is no longer in operation! Miles of Promenade that keeps on growing takes you past beaches, voces and cliffs from the Castillo de San Antón past the port, bringing you to the Tower of Hercules Sculpture Park, an open air museum in a setting steeped in legend, all the way round to the beaches of Orzán and Riazor. 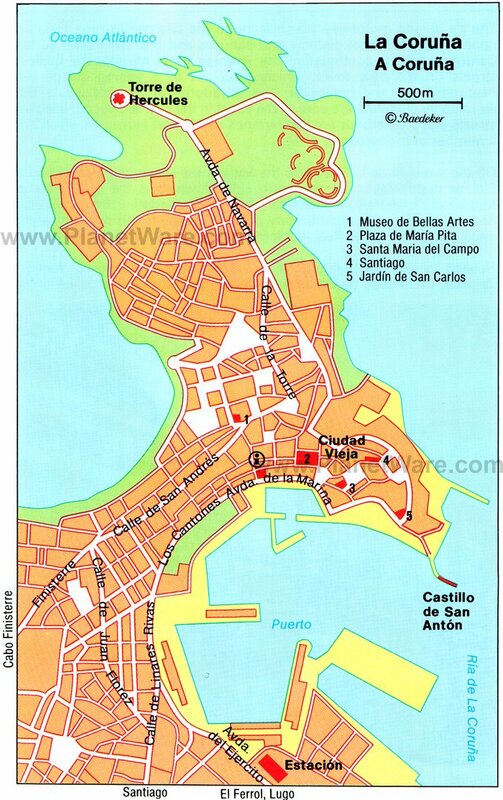 Most everything is walkable, possibly with the exception of Torre de Hercules, a 40 minute walk or a short trip by bus 3, 3A or 5 which stop in front of the terminal. Torre de Hercules is the oldest, still functioning lighthouse in Europe. Train schedules to Santiago de Compostela. The train station is about 2,5 km away from the cruise terminal. 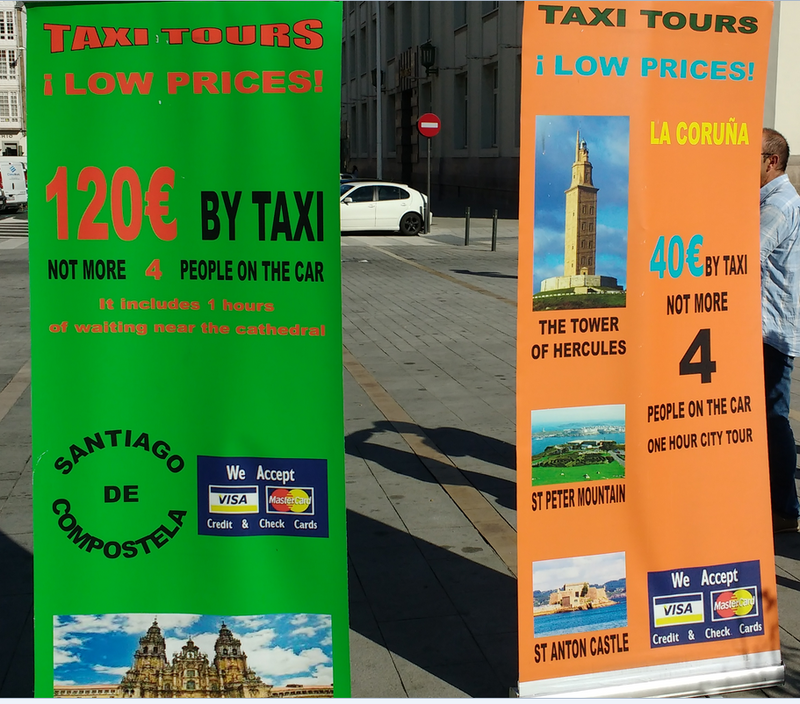 Taxis also offer city tours and excursions to Santiago de Compostela. Santiago de Compostela: Magnificent Santiago Cathedral is a monument to Christ's apostle, James, whose relics are believed to have been discovered here in the 9th century. Half a million pilgrims flock each year to this great shrine, which was once the third most important place of pilgrimage after Jerusalem and Rome. Four majestic squares surround the Cathedral. Around the Maria Pita Square you will find the main but small shopping streets. 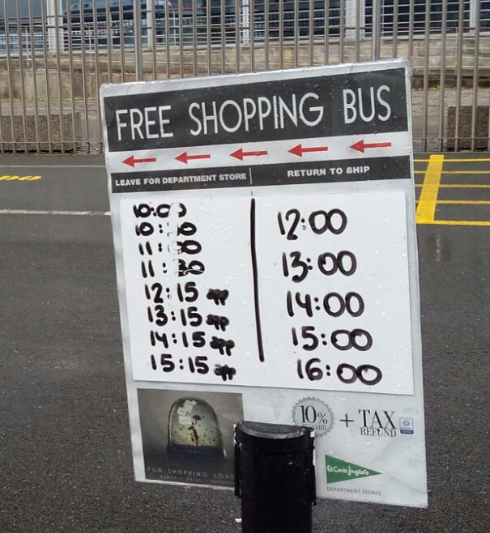 At the cruise terminal you will find a free shuttle bus to El Corte Ingles, a top Spanish department store. The euroThe euro is divided into 100 cents. • There are eight different coins: 1, 2, 5, 10, 20 and 50 cent, and 1 and 2 Euro. • There are seven different bank notes, for the following amounts: 5, 10, 20, 50, 100, 200 and 500 Euro. From the aft decks of your ship you can make a connection to the free WiFi of the Los Cantones Shopping center.